Poundmaker (Pitikwahanapiwiyin – named for the time-honoured way of building a pound into which buffalo would be driven and then killed), the Plains Cree chief, was born near present day Battleford in Saskatchewan in 1842, the son of an Assiniboin Stony holy man and a Cree-Metis mother from a leading family in the House band. Despite his mixed race background, he had a traditional Cree upbringing and was under the influence of his maternal uncle, Big Child (Mistawisis), a prominent figure in the Eagle Hills band. He was respected as a hunter and known for his consideration of others, giving generously to the hungry and needy, but he was thrust to prominence when he was ‘adopted’ by the Blackfoot leader, Crowfoot, following the death of the latter’s son and a short-term peace between the two tribes. For a while, he lived among the Blackfoot and was given the name Wolf Thin Legs and when he returned he brought with him a gift of horses from the Blackfoot, which, coupled with his position as Crowfoot’s adopted son, increased his status among his own people. Poundmaker and his wife, n.d.
Poundmaker opposed the treaty, challenging the intention to confine Indians to reserves and highlighting the inadequacy of the agricultural provision and the rations necessary for times of famine. As a result, the agreement was amended to include a famine clause, but he still refused to sign until 23 August when he did so at the behest of his band; however, he resisted agency life and formed his own band to live the traditional life for as long as possible after Red Pheasant moved to the reserve in 1878. Starvation forced him to settle on a reserve near Battleford in 1879 and while he did take up farming, he still opposed the government that turned its back on some treaty obligations and refused to acknowledge the conditions of near-starvation on the reserves when the farms failed (as was the case with many white farms in the area). 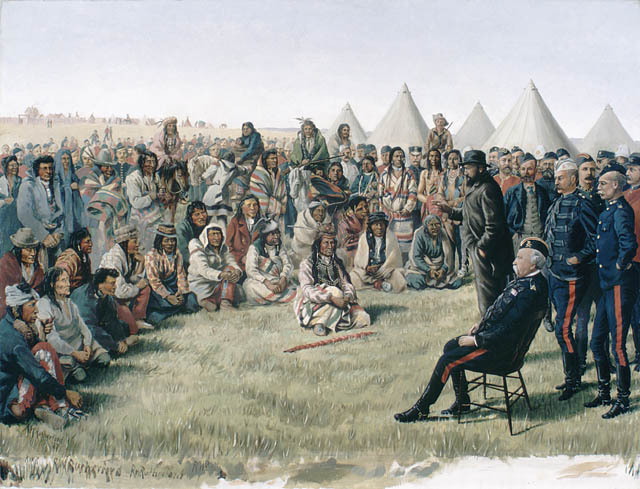 Poundmaker, along with the renowned Big Bear, who finally settled on a reserve in 1882, led the fight for decent and honourable treatment of their people and in June 1884, over 2000 people gathered for a Thirst Dance at Poundmaker’s reserve to discuss the worsening conditions. When the NWMP interrupted proceedings in pursuit of an Indian accused of assaulting a farm instructor, violence broke out and only the intervention of Poundmaker and Big Bear stopped it escalating. In fact, Poundmaker had gone so far as to inform Indian Commissioner Edgar Dewdney on fellow Cree chief Little Pine when he had tried to him to encourage Crowfoot to get the Blackfoot to join the Thirst Dance. When Riel established a provisional Metis government at Batoche in March 1885, violence was not far away. It came at Duck Lake later that month when an NWMP interpreter and Prince Albert Militiamen killed a Metis and an Indian; the resultant fighting, that involved Indians on the Metis side, saw the deaths of nine militiamen, three members of the NWMP and three Metis. Poundmaker saw an opportunity to lobby for food and took 60 people to Battleford, informing the agent that he wanted no part of the fighting, hoping that his loyalty would be rewarded with supplies, but the agent did not see things this way; worse, the fear of a joint Metis-Cree force led to hurried preparations for defence at Battleford. The agent refused to speak to Poundmaker and the Battleford residents stayed behind their fortifications. The desperate Indians looted some of the cabins lying outside the defences for food and left for their main village, but the government had already despatched 500 troops under Lieutenant Colonel William Otter to relive the citizens of Battleford. He marched on Poundmaker’s camp with 325 men, two cannons and a gatling gun; meanwhile other Indians had gathered around Poundmaker, fearful of the militia. Otter attacked, but the Indians fired from cover and the gatling gun was ineffective. Poundmaker actually intervened to stop the Cree from pursuing and possibly annihilating Otter as he retreated, but by this time the war faction among the Cree had increased their standing and the Metis agitated for further trouble. As a result, the Cree rode to Batoche to help Riel, but before they arrived, word was received that he had been arrested and his forces defeated. As peace chief, Poundmaker sent a message to negotiate surrender with the government forces under Major General Frederick Middleton. Poundmaker was ostensibly a peace chief, and when the militia attacked the camp’s control fell to the warrior society, led by a war chief, Fine Day, but he was blamed by a government that wanted to remove the Indian leaders and was placed on trial for treason after his surrender. Big Bear and Poundmaker in prison, 1886. Note Poundmaker has been allowed to retain his long hair. He and Big Bear were sentenced to three years each in Stony Mountain Penitentiary, Manitoba, but only served seven months, possibly due to ill health and the government not wishing to stir up trouble with the Blackfoot, one key chief of whom was Crowfoot, Poundmaker’s adopted father – indeed, it is thought that the reason his hair was not cut in prison, unlike Big Bear’s, was as a favour to Crowfoot. Four months after his release, in 1886, he died of tuberculosis, suffering a lung haemorrhage in Crowfoot’s village. The photo it's based on has already been discussed in the Identification of Unknown Photographs thread on this board. I've seen it labelled as Soup, no tribal affiliation - possibly Bad Soup, one of Gall's warriors; Dietmar's seen it as Two Crows and thinks it's a Barry; Jari's seen it as Two Crow, a Blackfoot. Who knows? One thing's for certain, the man in the photo looks nothing like Poundmaker! Who is the Indian - or Metis - with Poundmaker? If my sources are right he is Miserable Man, a Cree who was sentenced to death by the Canadians for killing carpenter Charles Gouin at Frog Lake. He was one of those hanged at a mass execution at Battleford on 27 November 1885. Pitikwahanapiwiyin [Poundmaker] was born around 1842 in what is now the North Battleford region of central Saskatchewan. He was the son of Sikakwayan (Skunk Skin), a Nakota shaman and a mixed French-Canadian-Cree woman, the sister of the Cree chief Mistawasis (Big Child). Culturally, he was Cree despite his Nakota and French-Canadian ancestry. Pitikwahanapiwiyin and his siblings were orphaned at an early age and were raised in the Pihew-kamihkosit (Red Pheasant) band near present-day North Battleford. Losing their parents at an early age, forced the children to become self-reliant. The Oral Tradition maintains that Pitikwahanapiwiyin and his older brother Yellow Mud Blanket were good hunters. In fact, Pitikwahanapiwiyin received his name as “Poundmaker” because of his skill in hunting bison. He was particularly adept in making buffalo pounds, which were used to trap herding bison. Pitikwahanapiwiyin first became noticed as a potential leader in the early 1870s. In 1873, he was adopted by Isapo-Muxika (Crowfoot) the principal chief of the Crees’ traditional enemy, the Blackfoot. 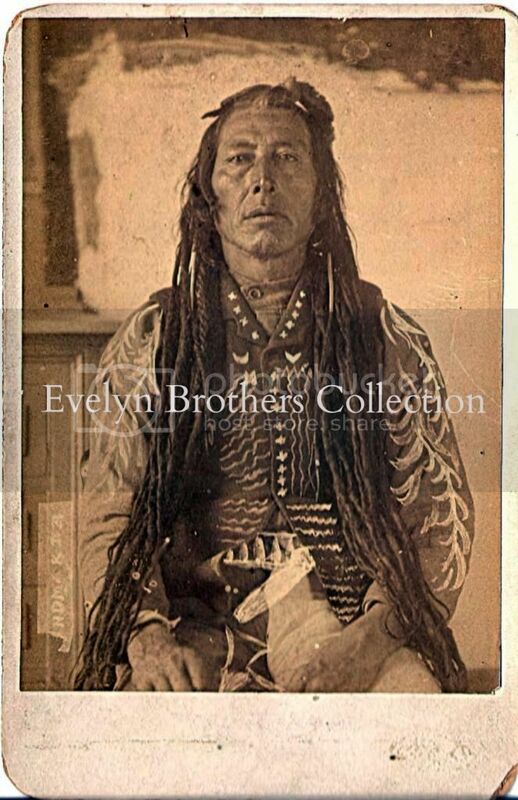 His Blackfoot name was Makoyi-koh-kin (Wolf Thin Legs). After returning from the Blackfoot as Isapo-Muxika’s adopted son and bringing back numerous horses, Pitikwahanapiwiyin’s stature among the Cree rose considerably. In 1876, by the time the treaty process (Treaty 6) reached the First Nations of what is now central Saskatchewan, Pitikwahanapiwiyin was considered a minor chief or councilor in Pihew-kamihkosit’s band. Poundmaker is standing in the center. Left of him is Yellow Mud Blanket. The Indian standing farest right is Wawanitch, who was hanged later. Photograph by Captain James Peters, "A"Battery, R.C.A. Thanks, Dietmar; I didn't know a photo of his brother existed, let alone another view of Poundmker. Another photo of Fine Day; this time with his son, Toostoos Awasis, taken at Battleford, 1886; I've also seen this dated to 1896, which would alter the date of the photo above because it's clearly the same session. The Fine Day photos are by Geraldine Moodie, one of the few female photographers to take Indian scenes out West, and should be dated 1896 after all. This is Miserable Man surrendering - presumably staged for the camera after the actual event. Is this the same man as above? It looks like he's been divested of his 'traditional' clothing and dressed in some kind of prison uniform, if it is. Perhaps he had a hair cut too. Here's Miserable Man and Wandering Spirit, painted by Alexander Campbell, a sergeant with the 7th Fusiliers, a battalion of militia which was headquartered in London, Ontario and sent to the West during the Riel Rebellion. He based these on his own sketches made in the field. Just in case anyone´s wondering who Miserable Man is in the group photo... the man standing in the center (fourth from left/third from right) is Four Sky Thunder, who we have seen in another group photo at Fort Pitt in 1884 (see: "Big Bear"-thread). Miserable Man is standing second from right. Unfortunately there is a shadow on his face in this scan. Hello friends! Has anyone access to materiel regarding the trial after the Riel-rebellion? I was thinking, more specific, of case files and names of those executed at Battleford. Chief Pitikwahanapiwiyin / "The Drummer"
Chief Poundmaker/Pitikwahanapiwiyin, AKA. "Wolf thin legs" (Cree)1839?-1886. This is an original albumen photograph, not found in any on line archives (Circa 1885). No photographers imprint on a blank card. Photographer: Anonymous? Last Edit: May 28, 2015 13:07:40 GMT -5 by rory: Questioin about old Manitoba prison uniforms. Great image! Thanks for posting it.